Julian Day is an artist, composer and arts commentator. He draws upon his training in both composition and visual art to create simple yet evocative works encompassing installation, video, sound, text and performance. Much of this is site-specific and collaborative, using dispersed homogeneous sound to explore the acoustic, architectural and relational properties of such varied spaces as railway sheds, marketplaces, laneways, parks and galleries. He looks to sound as a vital and enabling phenomena that enlivens negative space and emphasizes materiality, agency and intersubjective connection. 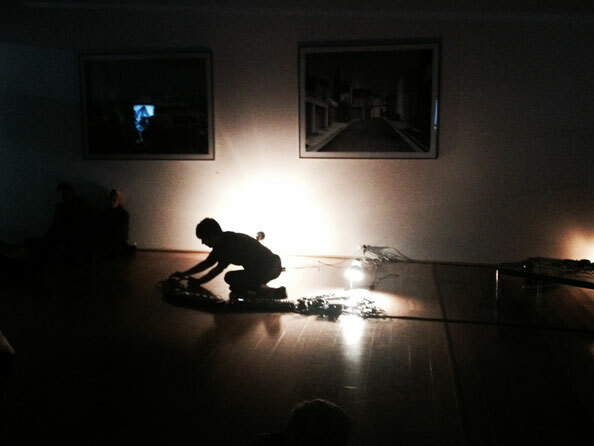 In his work he uses sound as an exploratory phenomena to highlight materiality, agency and relationality. He seeks to draw attention to the active yet invisible material around us – the air – by creating situations in which airspace is activated through sound. Air’s boundless ambient spread affords the study of human movement and interaction. He is fascinated by the opposing human tendencies to cooperate and compete; this is highlighted through our engagement with sound, an innately connective and intimate yet potentially intrusive material. Lovers (2012) is a sculptural intervention in which two pairs of matching synthesizers are pinned vertically between floor and ceiling by long metal rods. The rods act as frozen fingers that depress the keys and effect drones that fill the space. This creates a spatial interplay between the static physical objects, their ever-expanding sound and the spectator’s compliance within this field. Each pair of keyboards rests on either side of a doorway leading through the exhibition space, which implicates the viewer. By traversing this thoroughfare (a necessarily transitory or ‘non-space’) one enters into an immediate and non-negotiable stereophonic relationship with the work. Julian Day leads several ongoing collaborative projects including An Infinity Room (AIR) for multiple distributed synthesizers and Super Critical Mass, a large-scale participatory project in which temporary communities enact homogeneous sound strategies in public places. His work has featured at Whitechapel Gallery, Cafe Oto, Massachusetts Museum of Contemporary Art, Le Poisson Rouge (New York), Altez Finanzamt (Berlin), Queensland Art Gallery, Firstdraft, Campbelltown Arts Centre and the Institute of Modern Art among other spaces. He has worked with such musicians as Lisa Moore (New York), TILT Brass, Synergy, Australian String Quartet, The Song Company, Decibel and Orchestra Victoria.